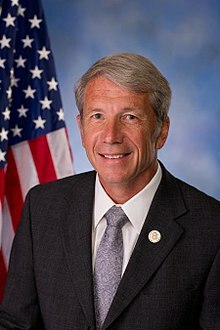 Walter Kurt Schrader (born October 19, 1951) is an American politician who has been the U.S. Representative for Oregon's 5th congressional district since 2009. He is a member of the Democratic Party and previously served in both houses of the Oregon Legislative Assembly. Schrader was born in Connecticut and received a Bachelor of Arts degree from Cornell University in 1973. While at Cornell, Schrader met Martha Northam and the two were married in 1975. Schrader earned his Doctor of Veterinary Medicine degree from the University of Illinois in 1977. A year later, the Schraders moved to Oregon, and Kurt opened the Clackamas County Veterinary Clinic in Oregon City, to begin his veterinary practice. Schrader served for 16 years on the Canby Planning Commission. Before winning his first election in 1996, Schrader served four terms in the Oregon House of Representatives. Schrader ran for the Oregon House of Representatives in 1994, where he lost to Republican Jerry Grisham in the general election by 38 votes. In 1996, Schrader ran again; and this time defeated Paul Kraxburger. He was subsequently reelected to the House in 1998 and 2000. In 2002, Schrader ran for the Oregon State Senate seat vacated by the retiring Verne Duncan, representing the 20th district in southwestern Clackamas County, including the cities of Barlow, Canby, Gladstone, Johnson City, Oregon City and portions of Milwaukie. He defeated fellow Oregon House member Kathy Lowe in a contentious Democratic primary, and then faced no Republican opposition in the general election. Martha Schrader was the Democratic nominee to succeed her husband, but lost in the general election to Wayne Scott. She served as a Clackamas County commissioner until 2009, when she was appointed by the same commission (with Martha recusing herself from voting) to replace her husband in the State Senate. In the Oregon Senate, Schrader served as co-chair of the Joint Ways and Means Committee in the 2003 and 2005 sessions, as well as chair of the Interim Joint Legislative Audit Committee in the 2005 session. To prepare for his House seat, Schrader resigned effective December 17, 2008. In May 2008, Schrader won the Democratic nomination for Oregon's 5th congressional district for the seat being vacated by Darlene Hooley. In the general election, Schrader defeated Republican Mike Erickson, winning election to the U.S. House. Schrader won the election with 54 percent of the vote to Erickson's 38 percent. Schrader won all seven of the counties in the 5th congressional district, though he posted a plurality win in Polk County. Schrader was challenged by Republican nominee and Oregon State Representative Scott Bruun and Pacific Green nominee Chris Lugo. Despite several polls showing Bruun ahead and pollster Nate Silver of FiveThirtyEight predicting Schrader would likely lose his bid for reelection, the final vote tally had Schrader winning by a fairly comfortable five-point margin, picking up 51% of the vote to Bruun's 46%. It was the closest House race in Oregon in 2010, a year in which Republicans picked up at least 63 House seats, but only one on the West Coast. Schrader won re-election 54.1% to 42.6%. Schrader won 53.6% to 43.1%. He was absent from the Congressional swearing-in on January 3, 2017, because he was on his honeymoon. He was the only member of Congress not to be sworn in that day. Schrader voted for the Budget Control Act. He voted both in favor of the Patient Protection and Affordable Care Act and for funding SCHIP. Schrader is a political moderate, breaking with his party more frequently than 63% of the Democratic Caucus. On December 17, 2009, Schrader announced that he would become a member of the Blue Dog Coalition. Schrader was ranked as the 50th most bipartisan member of the U.S. House of Representatives during the 114th United States Congress (and the most bipartisan member of the U.S. House of Representatives from Oregon) in the Bipartisan Index created by The Lugar Center and the McCourt School of Public Policy that ranks members of the United States Congress by their degree of bipartisanship (by measuring the frequency each member's bills attract co-sponsors from the opposite party and each member's co-sponsorship of bills by members of the opposite party). In December 2016, he severely criticized the election of Nancy Pelosi as House Minority Leader. "I'm very worried we just signed the Democratic Party's death certificate for the next decade and a half," he said. Representative Schrader is pro-choice and has received a 100 rating from both Planned Parenthood and the National Abortion and Reproductive Rights Action League. In May 2012, Schrader opposed and voted against the Prenatal Nondiscrimination Act of 2012, introduced by Republican Representative Trent Franks of Arizona. The bill proposed imposing criminal penalties for giving abortions in special cases, notably when based on gender, race or color of the child or parent. Schrader has received a score of 66% from Environment America and an 83% from the Sierra Club for his environmental positions. The League of Conservation Voters gave him a score of 93. Schrader, along with U.S. Senators Ron Wyden and Jeff Merkley, helped award a grant in September 2012 from the Department of Energy to the Northwest National Marine Renewable Energy Center (NNMREC). The grant will be used to create a new ocean energy test facility to test wave energy. Schrader received a 100% rating from the Children's Health Fund. In 2016, he received an 86% from American Public Health Association. He supports the Affordable Care Act. Schrader is the co-chair (along with Pennsylvania Representative Allyson Schwartz) of the New Dem Health Care Task Force, which set forth an agenda of "more effectively implementing health care policy in this country that improves payment and delivery systems." In July 2017, Schrader led a group of ten House Democrats who proposed a plan to improve Obamacare. The plan included a $15 billion "annual reinsurance fund to pay health insurers that enroll higher-cost, sicker individuals." In March 2017, Schrader told a district audience that the Trump administration seemed determined to deregulate agriculture. He admitted that agriculture regulations "were a bit of an overreach," causing problems for both dairy and dirt farmers. Schrader coauthored the Veterinary Medicine Mobility Act of 2014 (H.R. 1528; 113th Congress), a bill that would amend the Controlled Substances Act to clarify that veterinarians are not required to have separate registrations to dispense controlled substances outside of their principal place of business, such as when treating animals on a farm. In 2010, Schrader told a magazine for veterinarians that being a veterinarian "gives you almost an immediate cache[t] with both the animal welfare folks and the livestock folks," enabling one to "intercede and broker solutions to problems that ordinarily would be very difficult for people to handle." He also said that it was good he had attended veterinary college and "learned how to study 24/7, because that's what I have been doing in Congress since I got here." In December 2017, Schrader was one of only six House Democrats to support legislation allowing concealed handgun licensees to carry their weapons in all 50 states. He is one of the few Democrats to receive funding from the NRA. Schrader has received 2,500 dollars in donations. * In the 2010 election, Scott Bruun was co-nominated by the Oregon Independent Party and Chris Lugo was co-nominated by the Oregon Progressive Party. ** In the 2016 and 2018 elections, Kurt Schrader was co-nominated by the Oregon Independent Party. Schrader's district residence is the Kraft-Brandes-Culberston Farmstead in Canby, also known as Three Rivers Farm, which is listed on the National Register of Historic Places. ^ a b "Schrader Submits Resignation to Secretary of State". Salem News. Retrieved December 22, 2008. ^ a b c Kohler, Vince (May 1, 1997). "Vet makes a house call". The Oregonian. ^ Hunsberger, Brent (November 11, 1996). "More absentees vote but alter few races". The Oregonian. ^ Kohler, Vince (November 15, 1994). "Grisham wins by 38 votes". The Oregonian. ^ a b Mayes, Steve (May 22, 2002). "Schraders ahead in legislative races". The Oregonian. ^ "Martha Schrader will replace husband in State Senate". The Oregonian. January 9, 2009. Retrieved January 10, 2009. ^ "Senator Kurt Schrader". Oregon State Legislature. Archived from the original on December 11, 2004. Retrieved April 14, 2007. ^ "Schrader wins 5th District Democratic nomination". OregonLive.com. May 20, 2008. Retrieved May 20, 2008. ^ "Schrader wins 5th District". OregonLive.com. November 4, 2008. Retrieved November 4, 2008. ^ "Blue Dogs Welcome New Members" (PDF). Blue Dog Coalition. December 17, 2009. Retrieved December 17, 2009. ^ Kellogg, Barry (15 May 2013). "Protect Mobile Veterinary Services and Public Health and Safety: Support the Veterinary Medicine Mobility Act". Humane Society Veterinary Medicine Association. Retrieved 8 July 2014. ^ "Election Statistics, 1920 to Present". History, Art and Archives United States House of Representatives. United States House of Representatives Office of the Historian. Retrieved March 26, 2019. ^ "Voters' Pamphlet, Oregon General Election, November 2, 2010" (PDF). Oregon Secretary of State. Retrieved March 26, 2019. ^ "Voters' Pamphlet, Oregon General Election, November 8, 2016" (PDF). Oregon Secretary of State. Retrieved March 26, 2019. ^ "Voters' Pamphlet, Oregon General Election, November 6, 2018" (PDF). Oregon Secretary of State. Retrieved March 26, 2019. ^ Mayes, Steve (May 19, 2011). "Martha, Kurt Schrader, one of Oregon's best-known political couples, to divorce". The Oregonian. Retrieved April 18, 2015. ^ Mapes, Jeff (May 23, 2011). "Schraders continue divorce curse of Oregon's 5th District". The Oregonian. Retrieved April 18, 2015. ^ Sullivan, Bartholomew (January 4, 2017). "House member skips beginning of Congress for honeymoon". USA Today. Retrieved January 10, 2017. ^ "Oregon – Clackamas County". Nationalregisterofhistoricplaces.com. Retrieved April 14, 2008. This page was last edited on 26 March 2019, at 23:34 (UTC).